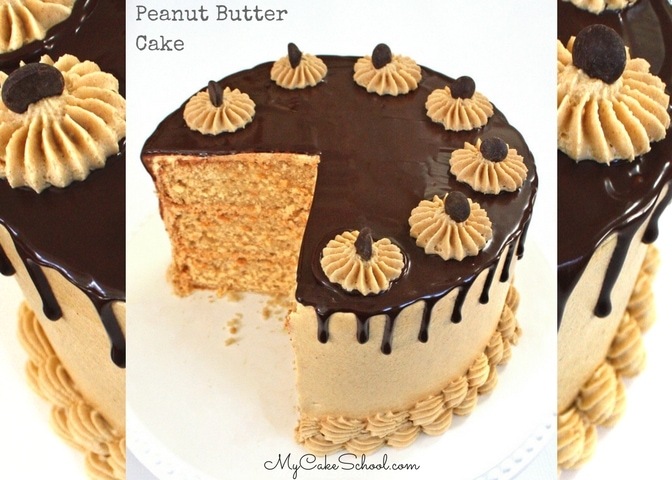 We’re SO happy to share this amazing homemade Peanut Butter Cake with you! 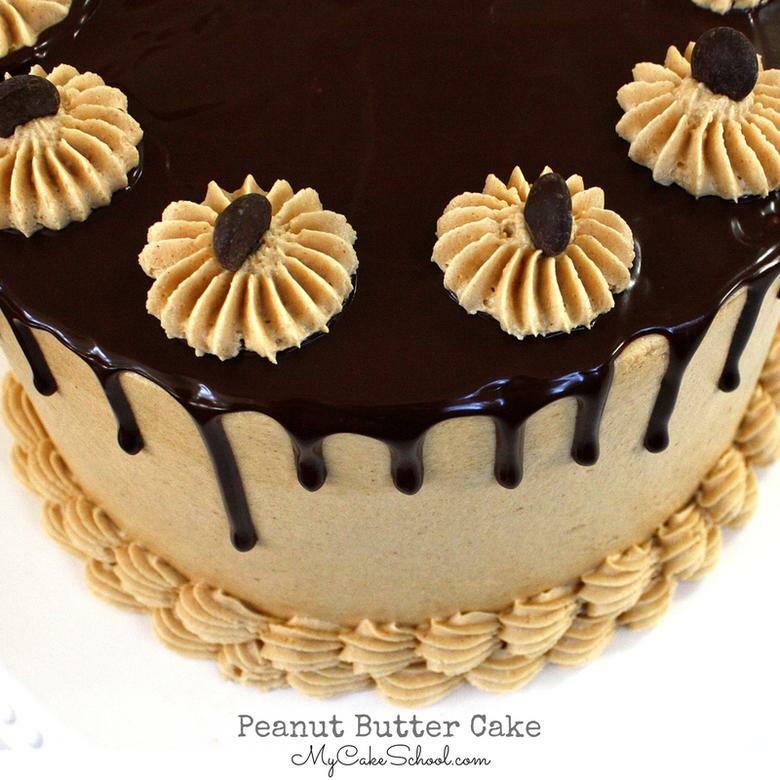 We’ve had a Peanut Butter & Chocolate Cake on our site for years, but for the true Peanut Butter fans, we needed a cake with even more Peanut Buttery goodness! After at least five or six recipe variations in the past week, countless blind taste tests and a fanatastic amount of leftover peanut butter cake layers (yay!) we can honestly say that our search for the BEST Peanut Butter Cake is finished! This is the one that belongs in your recipe box. It’s just SO good. 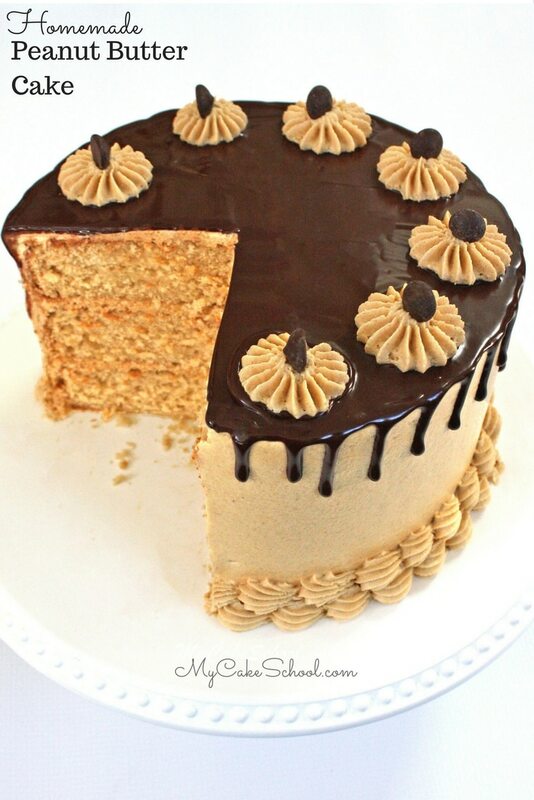 Of course, every Peanut Butter Cake should be slathered in an equally flavorful Peanut Butter Buttercream frosting! We actually had a bit of a breakthrough with our frosting. Our Peanut Butter Buttercream has always been one of my favorites for chocolate cakes and cupcakes. I’ve sung it’s praises for years. However, I had always used it as a cake filling or for swirling onto cupcakes. I hadn’t used it to frost an entire cake. As I began to frost our peanut butter cake, I noticed that the frosting didn’t glide on as it should. The consistency was a little too peanut-buttery for that…and no amount of additional milk or mixing would fix it. Don’t get me wrong, I would eat it by the spoonful all day long if I could, but for frosting the whole cake it just wasn’t behaving. You’ll notice that this Peanut Butter Cake uses the traditional method of mixing (rather than reverse creaming) but the cake is delightfully moist, soft, and has a slightly dense consistency which I love. *Note that unlike most of our cake recipes, this cake pulls slightly away from the edges of the pan BEFORE the cake is completely finished baking. So, the best way to test for doneness is either to insert a toothpick in the center to check for doneness (it should come out clean when ready), or to lightly touch it in the center to see if it springs back. We hope that you enjoy this recipe as much as we have! For dramatic effect (and because peanut butter & chocolate is always a winning combination) we decorated the cake with a ganache drip around the edges. ***Substitution for Cake Flour: For each cup of flour in a recipe, remove 2 Tablespoons of all purpose flour (plain in the UK) and replace with 2 Tablespoons of cornstarch. For this recipe, measure out 3 cups all purpose flour, remove 6 Tablespoons flour and replace with 6 Tablespoons cornstarch. Whisk to blend. Preheat the oven to 350 degrees. Grease and flour three 8 inch round cake pans. Place a circle of parchment paper or wax paper in the bottom of each pan. In a medium bowl add the cake flour, baking powder, baking soda and salt. Whisk at least 30 second to blend. Set aside. In a medium bowl add the milk and sour cream, whisk to blend the sour cream into the milk. Set aside. In the bowl of your mixer, beat the butter on medium speed until softened and smooth. Slowly add the white and brown sugar and beat at medium speed for 5 minutes. It will lighten in color and be fluffy. Add the peanut butter, oil and vanilla extract and mix until blended into the butter sugar mixture. Add the eggs one at a time, mixing after each until the yellow of the yolk is blended in. Add the dry ingredients alternately with the wet ingredients, beginning and ending with the dry ingredients (3 additions of dry and 2 of wet). Mix at medium speed until just blended in. Do not over mix or mix above medium speed. Bake at 350 degrees for 25 to 30 minutes. Be sure to check for doneness with a toothpick inserted in the center of the cake. It is done when the toothpick comes out clean or with just a few crumbs attached. Let cool in the pan 10 minutes then turn out. In the bowl of your mixer add the butter and mix on medium speed until the butter is softened and smooth. Add the peanut butter and mix until blended. Gradually add the powdered sugar alternately with the milk. Add vanilla. Mix on medium speed 4 to 5 minutes until smooth. Remove and allow to sit for one minute. Gently stir and press chips to aid in melting. If there are still unmelted chips, microwave for 5-10 seconds. Stir and repeat as necessary. Be very careful not to overheat. *Microwave times may vary. If you are making a smaller amount of ganache, you should reduce the microwave time. If your chocolate hasn't melted after the recommended amount of time, simply microwave in small 5-10 second increments until it has nearly completely melted. Let sit one minute, then stir until smooth. Load the ganache into a disposable piping bag, snip the tip away to expose a small opening, and apply drip around the edges and then spread additional ganache over the top. 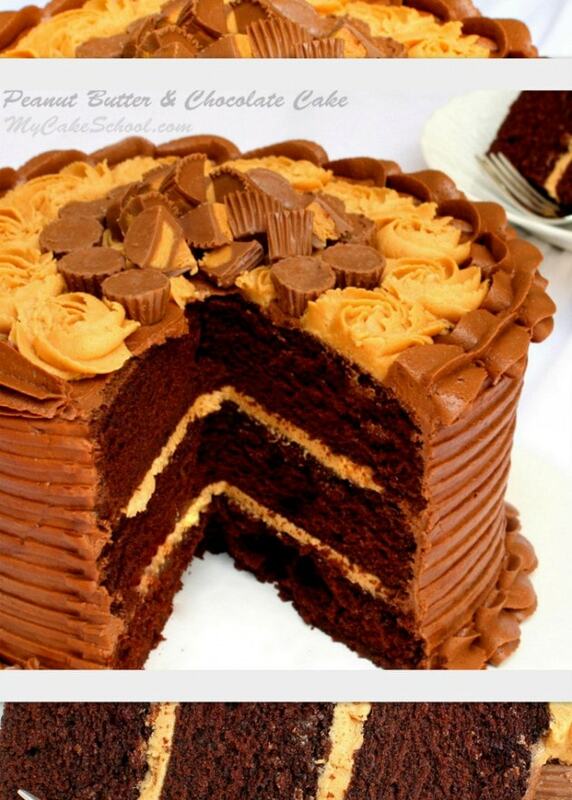 You may also like our Peanut Butter & Chocolate Cake! Finally, if you are interested in joining My Cake School, we would love to have you! You can find out all of the details on our Join Page. Members of My Cake School have full online access to hundreds of our cake video tutorials for as long as they are members. ** You can make your own cake flour: For each cup of flour in a recipe, remove 2 Tablespoons of all purpose flour (plain in the UK) and replace with 2 Tablespoons of cornstarch. For this recipe, measure out 3 cups all purpose flour, remove 6 Tablespoons flour and replace with 6 Tablespoons cornstarch. Whisk to blend. In a medium bowl add the cake flour, baking powder, baking soda and salt. Whisk at least 30 second to blend. In the bowl of your mixer, beat the butter on medium speed until softened and smooth. Slowly add the white and brown sugar and beat at medium speed for 3-5 minutes. It will lighten in color and be fluffy. Pour heavy cream over the chocolate and place in the microwave for 1 minute. Remove and let sit for 1 minute to soften. Stir, then microwave in 10 second intervals until the chips are nearly melted. Then allow to sit for 1 minute more, stir until it takes on a silky smooth consistency. *Microwave times may vary. If you are making a smaller amount of ganache, you will reduce the microwave time. If your chocolate hasn’t melted after time recommended in the instructions, simply microwave in small 5-10 second increments until it has nearly completely melted. Let sit one minute, then stir until smooth.